SWM has withdrawn further from Punjab and parts of Haryana and Rajasthan on 8th September (as per Vagaries). The (Bay) UAC very much present and persisting over South AP coast...another UAC over West Gujarat formed on Sunday 8th, and disturbed the wind flow, and brought conflicting winds over N.I.Karnataka and Marathwada...as (attempted by me) to show in map. Monday 9th: Interior TN , with Vellore district and West of this region. Heavy rains also expected in N.I.Karnataka. Even though system is moving away, Chennai will get Thunder showers on Monday and Tuesday. Cities to watch for Heavy rains: Vellore, Ambur, Bellary, Guntakal. Tuesday 10th Night thru Wednesday 11th: More regions get rains further towards the West. South Madhya Mah, adjoing Karnataka, S.Konkan and Goa get rains. Places to watch for heavy rains: Tirupati, Belgaum, Miraj, Goa, South Konkan (Amboli races ahead). Tuesday and Wednesday, Pune and Mumbai can get Thunder showers in evening. Lonavala, Matheran and Mahableshwar should receive thunder showers. After the morning showers on 7th, rest of 7th and 8th full day saw only trace rains in most parts of Goa. The UAC over Gujarat delayed rains for Goa from Sunday night to Monday? Atul: yes, seems so..as explained. Sir so for mumbai nothing much happening..
Dreams and Wishes.Happy Ganesh Chaturthi to all.. !!! !GANAPATI BAPPA MORYA !!!! uac in guj coastis it providing rain in mumbai and noth konkan..fresh uac also seen goa karnatka coast. shouls bay uac and arabia sea uac merged together..should thhis uac provide heavy rain in mumbai.because mumbvai desperetly required rain..what abt ur pridiction..
Again heavy rains towards Vasai hill's like yesterday.hope the rains cover entire Vasai. Prediction about Hyderabad came true. It received 45mm rains yesterday. navi Mumbai - belapur heavy rains. rajesh sirs prediction on spot -> 9-10th sept.
SSET: any comments on the fact that rayalseema and south karntaka has recieved rains in past week or so . Heavily overcast in Goa. Light drizzles for now. The long expected west coast trough activity resumes for Goa and 15N? Rains moving towards Chennai from the sea..already light rains started in many areas..
Pune recorded 20.2mm rain ending 8.30am today. Heavy thunder shower lashed East Pune. entire mumbai and pune receive thunder shower it is because uac closing to goa...or normal withdrwal phenomenon...plz reply..
anathji recent peninsular rains due to uac are in way comparable to BB lays vidarbha has received for 8-9 serial lows. In fact we were expecting at least 200-300mm of rain in 24hrs but it turned out be less than 80-90mm of rain and in single day it weakened. Anyway something is better as yourself must be aware of kind of serious drought rayalseema and SE interior KAR is facing (if u are from south). Anyway Navi Mumbai is having non stop cyclonic like rains,thunders..Also MAHA is covered with deep clouds any intense rains possible??? SSEt @ i do agree so far the rains have given a miss to Davangere, Haveri, Koppal and parts of Chitradurga and Kolar which are traditionally rain shadow areas. Infact most of the farming in these areas is dry land crops with some horticulture. These places are indeed under water stress. Not sure whether its a long term trend. 75 mms in Hosaritti(Haveri) and Davangere got 61mms. 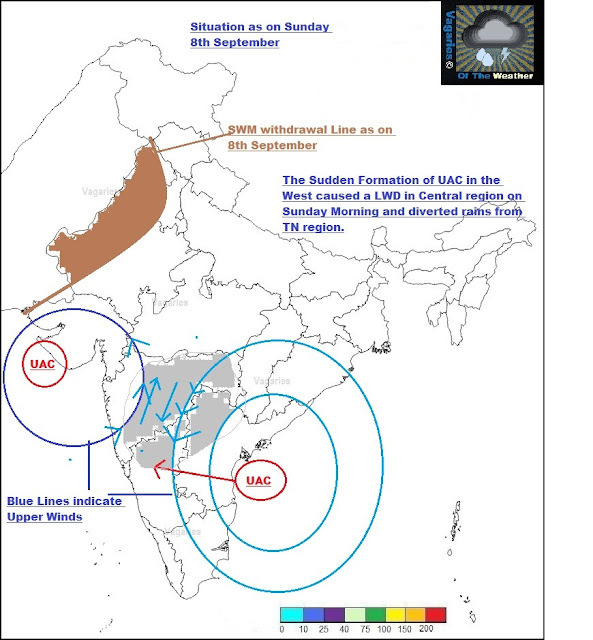 Moshinbhai: Yes, rainfall is due to UAC now crossing by Thursday into the sea...i have explained in blog.